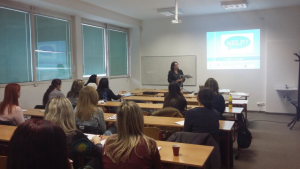 (7th March 2016) The HELP project Multiplier Event in Bratislava was opened by Assoc. Prof. Terézia Krčméryová, M.D., PhD, Vice-dean for International Relations of the Faculty of Nursing and Professional Health Studies of Slovak Medical University. Assoc. Prof. Krčméryová welcomed all participants of the event and expressed special acknowledgements to high number of attendees. Firstly, the idea and general vision of the HELP project was presented. As well as the logo and actual name of the project HELP – Healthcare English Language Programme. Secondly, all partners of our project team and their respective institutions/organizations/companies were presented. In the third place, Assoc. Prof. Krčméryová and Mgr. Vaneková explained roles and activities of Slovak Medical University in frames of the HELP project. Slovak Medical University as a leader of the Intellectual Output –O1: Needs Analysis prepared the Overall Report with key results important for future products and outputs within the HELP project. Subsequently the discussion was initiated. The attendees expressed their interest in the HELP project by lot of questions, mostly concerning apps for smartphones and tablets and use of project results in practice. Multimedia outputs of the project were rated very positively and participants were eager to test the new methods of learning. During farewell speech every attendee received HELP project flyer.